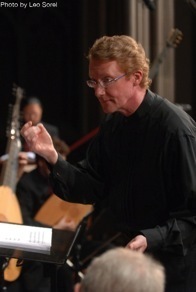 J. Owen Burdick, an internationally active composer, conductor, and clinician, came to Ascension and Saint Agnes in 2009. From 1990 to 2008 he was the seventeenth Organist and Director of Music at historic Trinity Church on Broadway at Wall Street in the city of New York. The late Michael Hammond, former chairman of the National Endowment for the Arts, described Burdick as "an extraordinary artist…a unique individual who is able to combine musical excellence and historically informed tradition with the pursuit of cutting-edge innovation." Owen Burdick conducts Ascension and Saint Agnes choir and baroque orchestra in Handel's Messiah. Burdick has been commissioned by the Episcopal Church to compose music for four General Conventions, most recently in 2006, and by the American Guild of Organists where, at their 2006 national convention in Chicago, he appeared as a guest soloist on the Marshall and Ogletree Virtual Pipe Organ, and presented his Trinity Choir in William Albright’s A Song to David. His compositions have been performed in major venues internationally, including New York, London, Paris, Los Angeles, and Reims. He has composed the scores for numerous documentaries and films, and his 1988 oratorio, Paschal Triptych: A King Portrait, was nominated for a New York Emmy Award. The 2007 Tribeca Film Festival featured Burdick and his choir performing Arvo Pärt’s Passio in a mixed-media collaboration with Paolo Cherchi Usai’s film of the same name. "A performance like the one led by Dr. J. Owen Burdick and the Choir and Baroque Ensemble of Church of the Ascension and Saint Agnes would turn any skeptic around about the power of the grand oratorio. Thoughtful performances such as Sunday’s performance by Burdick and his fine ensemble revealed a new perspective to the work, through fresh lenses. The church was full for the anticipated presentation and it was also a ‘debut’ sort to speak for Burdick. Arriving to D. C. in 2008, the distinguished music director came quietly with little fanfare. Sunday’s performance under his direction was only a foretaste of his impact on the D. C. Baroque music scene. "The choir never failed to impress. Just when it was thought that the same old interpretation of the choruses would be heard, a fresh nuance was pointed out. "Well thought out performances of this work, like this presentation by the Choir of Church of the Ascension and Saint Agnes is what the community needs to keep the freshness and vitality of Handel’s Messiah alive and vibrant."